Rangers eased into the second round of the Scottish League Cup with victory over Peterhead. It took until shortly before half-time for the Championship side to take the lead, with David Templeton firing in from a low Barrie McKay cross. The League One visitors rarely threatened, but it was not until the final quarter that Rangers' dominance exerted itself. Kenny Miller finished a cut back from James Tavernier, who fired the third. In what was manager Mark Warburton's competitive bow at Ibrox, Rangers continued the scoring form they showed in last week's 6-2 drubbing of promotion rivals Hibernian in the Petrofac Training Cup. Like that Easter Road display, the Glasgow side took their time building up a rhythm. The link-up was intricate but not always accurate, while the finishing could have been sharper. Nicky Law came close with a header after 25 minutes, while former Rangers goalkeeper Graeme Smith denied Lee Wallace. Templeton put his side ahead as he steered the ball into the corner of the net after being teed up by McKay. Rangers' Andy Halliday and opposition striker Rory McAlister clashed on the touchline as the game nearer the break, but referee Greg Aitken took no action. As the home side surged forward in the second half, Ryan Strachan cleared Martyn Waghorn's deflected shot off the line. A second goal did arrive when substitute Miller finished off at the back post after Travernier had burst into the box to cross. Waghorn's curling effort from 20 yards was stopped by the left post and it was Travernier who put a gloss on the scoreline as he thumped past Smith with eight minutes left. Match ends, Rangers 3, Peterhead 0. Second Half ends, Rangers 3, Peterhead 0. Rory McAllister (Peterhead) is shown the yellow card for a bad foul. Corner, Rangers. Conceded by Graeme Smith. Attempt saved. Martyn Waghorn (Rangers) left footed shot from the centre of the box is saved in the bottom left corner. Foul by Danny Wilson (Rangers). Corner, Peterhead. Conceded by Andy Halliday. Attempt blocked. Rory McAllister (Peterhead) right footed shot from outside the box is blocked. Attempt missed. Nicky Clark (Rangers) right footed shot from the centre of the box is close, but misses to the right. Attempt saved. Jason Holt (Rangers) right footed shot from the centre of the box is saved in the bottom left corner. Attempt missed. Martyn Waghorn (Rangers) left footed shot from the right side of the box is too high. Goal! Rangers 3, Peterhead 0. 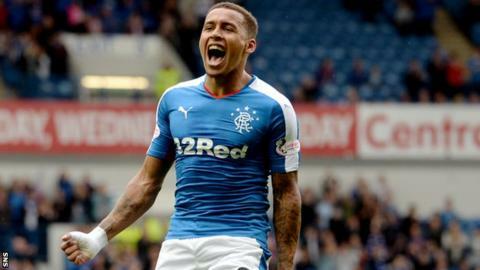 James Tavernier (Rangers) right footed shot from the centre of the box to the bottom left corner. Assisted by Nicky Clark. Attempt missed. Kevin Dzierzawski (Peterhead) right footed shot from outside the box is too high. Corner, Peterhead. Conceded by Lee Wallace. Martyn Waghorn (Rangers) hits the left post with a left footed shot from outside the box. Goal! Rangers 2, Peterhead 0. Kenny Miller (Rangers) left footed shot from the left side of the six yard box to the centre of the goal. Assisted by James Tavernier. Substitution, Peterhead. Andy Rodgers replaces Jamie Redman. Attempt missed. Danny Wilson (Rangers) header from the centre of the box is too high. Corner, Rangers. Conceded by Steven Noble. Attempt blocked. Dean Shiels (Rangers) left footed shot from the centre of the box is blocked. Corner, Rangers. Conceded by Ryan Strachan. Attempt saved. Martyn Waghorn (Rangers) left footed shot from outside the box is saved in the top centre of the goal. Substitution, Rangers. Nicky Clark replaces Barrie McKay. Martyn Waghorn (Rangers) wins a free kick in the defensive half. Corner, Rangers. Conceded by Nathan Blockley. Substitution, Peterhead. Scott Ferries replaces Jordon Brown because of an injury. Barrie McKay (Rangers) wins a free kick on the left wing.